For the Iranian people, the choices in this year’s presidential election were appalling. They could choose to return Hassan Rouhani to a second term after his first term was marked by a nuclear deal that provided no discernible economic benefits to them, presiding over a government rife with corruption and massive protests over inflated salaries for officials, and a brutal crackdown on human rights that saw everyone from students and bloggers to journalists and artists imprisoned. Or they could select Ebrahim Raisi, a cleric with no discernible public backing who is widely reviled for his role in executing 30,000 imprisoned Iranian dissidents in 1988. To say the Iranian people’s choices ranged from bad to awful is an understatement, but that is exactly the kind of predicament the mullahs wanted to arrange for their people; to be forced into selecting the lesser of two evils. It is also why Rouhani’s election was met with media messages of a “moderate” win; all of which suits the mullah’s purposes to frame the narrative for the next four years as a moderate Iran confronts an “extremist” Trump administration with its “extremist” Arab allies. The mullahs are not stupid, they realize the geopolitical landscape is rapidly changing on them as their Arab rivals are linking arms with a newly energized U.S. in articulating a policy of confronting Iran rather than appeasing it. What is driving that change has been the Iranian regime’s own policies over the past four years which has seen the regime ignite the Syrian civil war and turn it into an abattoir of death. It has also started the Houthi rebellion in Yemen which has drawn Saudi Arabia into a direct proxy war with Iran. Couple that with an economy mired in mud and a newly aggressive ballistic missile program that has freaked out the world and you get a recipe for unlikely alliances being forged now. You know things are different in the world when direct, non-stop service between Tel Aviv and Riyadh has been inaugurated. But the change in the political environment worldwide pales in comparison to the stark changes happening internally in Iran. The regime has already struggled mightily to suppress social media and encrypted communications apps such as WhatsApp and Telegram. It’s first taste of the power of social media campaign in disputed 2009 elections in which protests and the coverage of the crackdowns were largely promoted and carried on social media. In response under Rouhani, the regime has sought to suppress all dissent online which is a virtually impossible exercise. The regime has used its Basij paramilitaries to seek out and arrest anyone viewed as disruptive whether it’s a Snapchat post of a woman riding a bicycle or an Instagram post of a woman not wearing a hijab. Evin Prison has been filled with such threatening individuals as a bunch of students posting a viral video of them dancing to Western music. Nowhere has the internal threats to the regime been more apparent than in the increased visibility and activity of organized Iranian resistance groups; long a thorn in the mullah’s side. According to dissident media outlets, a vast network of dissidents supporting the Iranian opposition People’s Mojahedin Organization of Iran (PMOI/MEK) came alive in unprecedented scale to voice the true feelings of the Iranian people about the candidates and the regime in its entirety. Cities and towns across the country, including major metropolitan centers such as Tehran, Mashhad, Isfahan, Tabriz and Shiraz, have witnessed scenes of brave activists daring long odds and challenges to put up large posters and images of Iranian opposition leader Maryam Rajavi from bridges and overpasses, car windshields and even the walls of buildings belonging to the regime’s security forces, such as the Revolutionary Guards and Basij. Open support for the MEK inside Iran is forbidden considered a capital crime to any activists that are caught, with torture and possibly even execution awaiting them. Long-time MEK supporter Gholamreza Khosravi was jailed and eventually executed for merely providing financial support for an MEK-affiliated satellite TV network in 2014. Also, the Iranian regime’s claims of a “historic” election in terms of turnout has also been calle3d into question by the National Council of Resistance of Iran which outlined how the regime in the past has simply cooked the election books. Outside of the media-centric environs of Tehran, voter turnout was largely apathetic and low with reports of boycotts in many provincial towns and cities from locals dissatisfied with the economic problems besieging them. What hasn’t changed in Iran is the basic make-up of the power elite still holding control firmly in their hands which is the religious body comprising most of the parliament and councils governing the judiciary, civil service and financial sector, along with the Revolutionary Guard Corps which still controls virtually all the state industries and companies. As Rouhani moves forward, he will find a very different world than the one that embraced a flawed nuclear deal two years ago. The era of appeasing Iran is over. With only scant days before the Iran presidential election, the Iran lobby’s most ardent supporters weighed in on the race with typical obsequiousness. The best example was an editorial by Trita Parsi, founder and president of the National Iranian American Council, in Foreign Affairs. Predictably he offered up one of the more ridiculous spin lines in the history of disinformation on behalf of the Iranian regime. Parsi actually tried to push the idea that top mullah Ali Khamenei had no influence on the outcome of the election and that “reformist” former president Mohammad Khatami was the real power in this election. Parsi bases that silly idea on the concept that Khamenei represents the “establishment” and as such his perceived candidates are constantly defeated at the polls by the Iranian people. To say Parsi’s reasoning is flawed is like saying President Trump likes to tweet. First of all is the idiotic idea that Khamenei has no influence on the election. The Supreme Council has the final say in terms of vetting candidates to appear on the ballot for any election right down to a lowly provincial seat. Khamenei has the right to directly select half of the Council’s members. The others are appointed indirectly by him as well. So right off the bat, Khamenei exercises a monopoly on who even goes on the ballot before the first vote is cast. Secondly, the regime’s constitution itself ensures that only candidates meeting specific loyalty tests to the regime and its theocracy are allowed to run for office, thus ensuring adherence to preserving the mullah’s rule in Iran. Control of who appears on the ballot allows Khamenei to control the narrative as to which candidates are perceived to be “moderate.” By stacking the ballot with four candidates who essentially have no chance at all, Khamenei can create the perception of a clear choice between a “moderate” Hassan Rouhani or a “hardline” Ebrahim Raisi. Over 1,636 people registered to appear on the ballot for president. Only six were approved by Khamenei’s council. Both of these men are dyed-in-the-wool insiders who are dedicated to serving the religious theocracy and Khamenei’s wishes, but Iran, with the help of the Iran lobby, creates a false perception of a real “choice” in the election. “Another unknown candidate by the name of Mahmoud Ahmadinejad defeated the presumed favorite, the late Ali Akbar Hashemi Rafsanjani, who is considered one of the pillars of the revolutionary regime. But precisely because Rafsanjani was perceived as an embodiment of the establishment, the antiestablishment vote went to Ahmadinejad,” Parsi writes. Of course, Parsi tries to posit that the 2009 race, which was widely considered rigged for Ahmadinejad causing widespread mass protests, was in fact actually a portrayal of the former “outsider” to be an “insider” now which caused the vote discrepancy. Far from being honest with the reader, Parsi tries yet again to pull the wool over everyone by slicing Iran’s politicians into neat little camps opposed to each other and representing widely divergent viewpoints. The reality is that there is very little difference between these candidates since are all loyal members of the regime. Take Rouhani for instance. He was elected on the platform of being a moderate vowing reforms, but during his tenure, Iran has taken a huge step backward in human rights and now is involved in three wars sending thousands of young Iranians to fight and die, while the mullahs and elites skim huge personal fortunes through a massive network of corrupt shell companies. These are not the facts that Parsi wants people to know about since it would ruin his carefully constructed fantasy. Benny Avni writes in the New York Post how this election may be one where Khamenei decides the pretense of a moderate face for the regime is no longer necessary since Iran gained concessions from the nuclear deal already. “Just as Americans and others are reorienting themselves for the age of President Trump, so are the mullahs. In their calculation, they now need to replace the friendly sounding voices, like those of Rouhani and his sidekick, Foreign Minister Javad Zarif, with angrier men,” Avni writes. “Raisi is an insider who has climbed the political ladder. Supreme Leader Ali Khamenei is said to favor him as successor, when the time comes,” he adds. More evidence in the manipulation of the outcome was on display when Raisi’s path to the presidency became easier Monday, when a fellow hardliner, Tehran’s Mayor Mohammad-Baghar Ghalibaf, dropped out of the race. Analysts believe Ghalibaf won the TV debates and is clearly more qualified, but, under pressure, he’s now calling on supporters to vote for Raisi. What is clear from all this is that Parsi makes no mention of Raisi in his editorial which only demonstrates how close Raisi is to becoming elected and returning a public hardliner back into power to confront a U.S. administration no longer committed to a policy of appeasing Tehran. What If Iran Held an Election and No One Voted? The Iranian regime’s presidential election is fast approaching on May 19th and with it comes expectations around the world of what the election will mean. For the mullahs in Tehran and their overlord, Ali Khamenei, it has meant staging an election that gives the world the appearance of being fair and free, but in fact is anything but. They have even sought to create the aura of tension and debate by offering up “hardliners” to run against “moderate Hassan Rouhani. In reality, this election—like so many others before it—has already been pre-ordained. The difference is that the mullahs learned their lesson from the disastrous 2009 re-election of Mahmoud Ahmadinejad which convulsed Iran in massive street protests that had to be put down ruthlessly and aired live on then-novel fledgling social media networks around the world. Since then the mullahs offered up a less contentious election in 2013 with Rouhani being foisted on the world as a paragon of moderation and friendly attitudes through the removal and disqualification of any other threatening candidates to make the ballot. The parliamentary elections last year saw a massive crackdown against journalists, dissidents, artists, students, and just about anyone else that might have Twitter on their cellphone. Now the mullahs are staging an election where the outcome has already been pre-determined and the rest of the world just has not been clued in yet. Slater Bakhtavar, an attorney, foreign policy analyst and political commentator, described the election farce in a piece for Forbes. Western media are bafflingly enamored of extolling the virtues of Iran’s “free” and “democratic” electoral process, seemingly oblivious to the fact that it is neither. Anyone holding naive notions of any and all Iranians having some unalienable right to submit their name for election, then have a fair and equal chance to earn votes through rigorous campaigning and the debate of ideas, would do well to abandon such lofty fantasies, he writes. “The actual voting process is riddled with fraud, too. The government meticulously plans initiatives to transport poor people (whose political leanings are known beforehand) to the polling stations, and official government employees are essentially ordered to vote. Tactics such as these allow officials to report enormous voter turnout numbers, pleasing journalists and maintaining the facade of Iran’s democratic international image,” Bakhtavar adds. Bakhtavar notes how the Obama administration fell for the façade or the mullahs in supporting a flawed nuclear deal that did not reform the regime’s government and shockingly enabled the mullahs by paying cash ransoms for American hostages, thereby convincing the mullahs their path of squashing human rights was the correct one and carried no repercussions. He does note however that the election of President Trump provides an opportunity to reset the scales with Iran and empower an Iranian dissident movement that has been under constant assault by the mullahs for three decades. “President Trump is correct in his backing of the Iranian people, both morally and pragmatically. It has always been the right thing to do to support these oppressed people as they increasingly seek reform and the formation of a freer society, but now, in the early 21st century, the timing is perfect,” Bakhtavar said. “New technologies exist now that allow communications on a wider scale than ever before, enabling the proliferation and exchange of new ideas and ways of thinking. Free thought is a danger to Iran’s theocratic regime, as it is to all dictatorships. These technologies are to be encouraged among the people of Iran, and those people should be afforded the dignity and respect of being addressed directly – not through their tyrannical rulers,” he added. This explains why the mullahs spend such an inordinate amount of the regime’s time and resources to confiscating satellite dishes, blocking access to social media apps, tracking illegal online activity and trying to break the encryption of communications platforms such as Telegram and WhatsApp. The mullahs live with the very real fear that if the Iranian people were ever able to organize and communicate effectively, especially with the outside world and dissident and human rights groups, their tenuous hold on power would slip away. Mohammad Mohaddessin, chair of Foreign Affairs Committee of the National Council of Resistance of Iran (NCRI), one of the largest Iranian dissident groups, answered this very real concern of the mullahs. “Over the past 38 years the clerical regime has entirely relied on execution and prison to stay in power and all regime’s officials, including Rouhani who has been one of the decision makers in the regime during this period, are directly responsible for the crimes committed,” Mohaddessin said. To that end, the Iranian resistance movement has offered an alternative to the Iranian people dissatisfied with their choices in the election: Simply boycott the vote. An online campaign has been picking up steam with photos of demonstrations in Iran beginning to leak out on social media of Iranians calling for a boycott of the elections. While it’s doubtful the mullahs would even reveal the effects of any boycott since returns are usually suspected of being falsified in the first place, any boycott is a sign of growing resistance, especially in a regime where any overt act of defiance often lands one in prison or worse yet at the end of the hangman’s noose. But some intrepid Iranians are talking to Western media about participating in such a boycott over their disgust with their choices. There are already warning signs on the horizon for Rouhani. A report Monday by the state-run IRNA news agency said a survey of over 6,000 eligible voters found over a third saying they would not be voting, while another 46 percent said they would pick their candidate later. It offered no margin of error on the nationwide random survey, according to Bloomberg. We can only hope that on May 20th the full extent of the dissatisfaction of the Iranian people is heard. What ‘s the line? Same stuff, different day? That’s accurate when it comes to describing the so-called “presidential election” scheduled for May 19th. Elections in Iran are neither fair nor free and because of their illegitimacy, they invariably result in further weakening the already embattled regime; like a cancer eating away at a patient. The most common fallacy being trumpeted around about how the regime government works, especially by Iran lobby advocates such as the National Iranian American Council, is that Iranian elections are democratic. 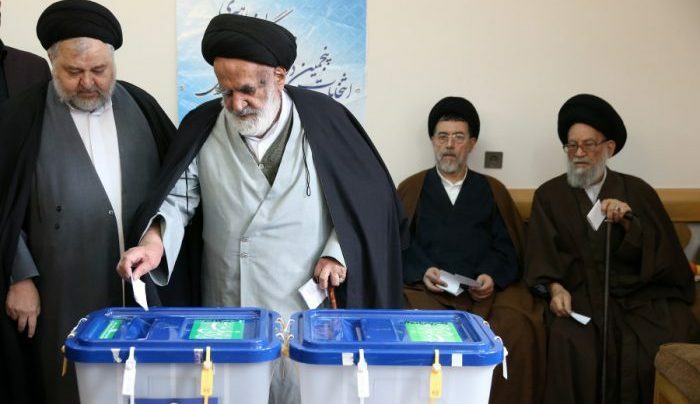 When elections are held, all candidates are vigorously vetted by the Guardian Council, a body of 12 clerics, six of whom are appointed directly and the other six indirectly by top mullah Ali Khamenei. When the president is selected, he is nothing more than a puppet, acting according to the will of the supreme leader. Based on the Islamic state’s constitution, the president must be confirmed by the supreme leader no matter what the people voted. It’s the kind of absolute control that campaign managers in Western nations must envy. Democracy can be such a messy experience that the mullahs in Tehran have done away with the inconvenience. The idea that “moderates” are going to be empowered is silly when you consider that Khamenei, has final veto power over foreign policy, treaties, military commitments, economic policy, the judiciary and culture. These are enforced through state mechanisms appointed by him including the Revolutionary Guards and Quds Force (which owns over two-thirds of the industrial capacity of the economy through shell companies), Basji paramilitaries and morality police that enforce, arrest and imprison anyone violating generic sharia laws designed to stamp out dissent. And all candidates, including the incumbent Hassan Rouhani and leading pro-Khamenei camp loyalist Ebrahim Raisi, are in line with all the regime’s strategic objectives. Otherwise, their candidacy would not enjoy Khamenei’s necessary approval. Hassan Rouhani, although portrayed as a moderate by the Iran lobby, he is known for key roles in supporting terrorism; his support for chemical, biological, and nuclear weapons; how he duped the West when he was Iran’s top nuclear negotiator; his early years as a fundamentalist activist and protege of Khomeini. His record during his current term clearly demonstrated his hardline opposition to human rights, freedom, and democracy. The lengths that the Iran regime will go to keep its grip on power may be shown in the grisly April 29th assassination of exiled Iran TV executive Saeed Karimian in Istanbul. The regime claimed that Karimian had close relations with the Iranian opposition; going so far as to photoshop an image showing Karimian meeting with Iranian opposition leader Maryam Rajavi. Karimian had strongly denied such reports in the past, but all Iranians know that linking anyone to the PMOI/MEK is tantamount to an undeclared execution order. The killing of Karimian is indicative of the new paranoia gripping the theocratic regime; the ruling mullahs are now looking like they are in their death throes. After eight years of appeasement by the Obama administration, the plethora of human rights violations within Iran has increased. More than 3,000 people have been executed since the “so-called” moderate Hassan Rouhani took office as president in 2013. It would not be surprising that the mullahs anticipate another uprising, similar to what occurred following the fraudulent second election of Mahmoud Ahmadinejad in 2009. With this presidential election, they are terrified that the people of Iran will once again take to the streets to protest the oppression and corruption that have been the modality of the Iranian regime since the 1979 revolution. Nevertheless, whether Rouhani or Raisi becomes president, one thing is clear: the April 29 assassination in Istanbul and political discontent among the populace is a political signal indicating where the Iranian theocracy is heading after the elections. The only solution for the people of Iran is to seek change from within. This can be achieved by supporting opposition groups such as National Council of Resistance of Iran, which is largest opposition against Tehran. This coalition enjoys the most support among Iranians inside the country and abroad, as seen vividly in its annual 100,000-strong rallies, where supporters gather in Paris from all four corners of the globe. Elections in the Iranian regime are not left up to chance or to the Iranian people for that matter. The ruling mullahs have always wanted a neat, tidy election process that harbors no dissent and provides for no surprises. In practicality, the mullahs admire the no-contest elections where the ruling elite often hold all the cards. This may explain why Iran has worked closely with North Korea in exporting that regime’s ballistic missile technology, while it seeks to be a major oil trading partner to China and a major arms buyer to Russia. The history of Iranian elections has been less than spectacular. Last year during parliamentary elections, the regime wiped off the ballots thousands of candidates deemed unsuitable for running. The most common attribute of the eliminated candidates was a disturbing tendency to being a dissident voice. In the infamous presidential election of 2009, the much-reviled Mahmoud Ahmadinejad was re-elected in what was widely regarded as a rigged election that resulted in massive protests harshly put down by the regime’s military resulting in thousands of deaths, arrests and prison sentences. The mullahs learned their lesson in 2013 by installing Hassan Rouhani as an affable, cheery candidate in contrast to the typical regime clerical candidate. 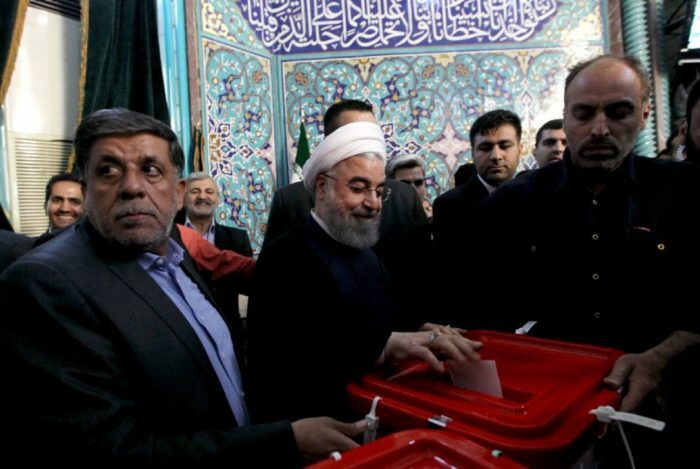 Now with presidential elections looming on May 19th, Iran is entering into another familiar cycle of political speculation. Unfortunately, none of it will matter much since the regime’s leadership, led by top mullah Ali Khamenei, controls the councils which will decide who will be allowed to run in the first place. But the Western media will again make the same mistake as it did before in trying to parse the Iranian regime’s politics into “moderate” and “hardline” camps, of which there are none. Iran has no viable opposition parties and all members and candidates swear the same allegiance to the Shia revolution and Khamenei. It is akin to essentially trying to find nuances between members of the same Nazi party in World War II-era Germany. 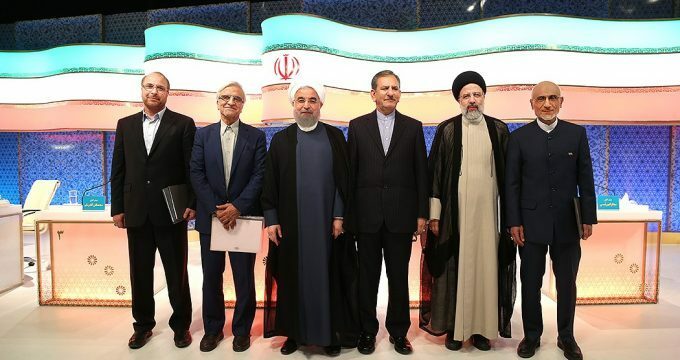 The best example of this mislabeling comes in the form of coverage over the announcement that certain candidates were put forward to challenge Rouhani as being part of the regime’s “hardline, conservative” blocs. 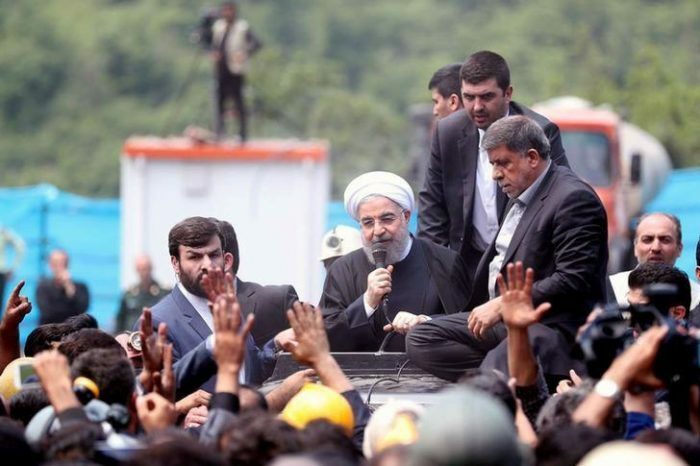 As Reuters described it: “A bloc of conservative Iranian political parties has nominated a powerful cleric as their candidate to run in next month’s presidential election to try to unseat the moderate Hassan Rouhani, Iran’s state news agency IRNA said. Five candidates were nominated, including Ebrahim Raisi, a powerful cleric who last year was appointed custodian of the shrine of Imam Reza in Mashhad, Iran’s second city. He also controls what is believed to be the Islamic state’s wealthiest institution: Astan-e Qods Razavi, a religious foundation that owns properties and land across the country. The 56-year-old cleric has held senior judicial positions, including prosecutor-general. Dissidents accuse him of authorizing a brutal crackdown against the opposition in the 1980s. The National Council of Resistance of Iran, the largest Iranian dissident groups, detailed Raisi’s bloody history on behalf of the regime. “In 1988, when he was Deputy Prosecutor of Tehran, he was one of the four individuals who Khomeini appointed to carry out his order to massacre the activists of the People’s Mojahedin Organization of Iran (PMOI/MEK). During that massacre, 30,000 political prisoners, who were primarily from the PMOI, were executed within a few months. An audio tape surfaced last summer, after 28 years, of Hossein-Ali Montazeri, Khomeini’s designated successor at the time, meeting with the ‘death committee’ in Tehran, including with Raisi, about 20 days after the start of the massacre. Montazeri told them that these executions were the biggest crimes committed by the Islamic Republic,” the NCRI said in a statement on its website. In that meeting Montazeri talked about how pregnant women and 15-year-old girls were executed during the massacre. Those who attended the meeting (including Raisi) condoned the mass executions. It was subsequently exposed that Raisi was the most active and most ruthless member of the committee. The audio file of the meeting between Khomeini’s then-successor and the “death committee” also corroborated this reality, the NCRI added. The Guardian Council, a powerful body controlled by Khamenei, will announce later this month which candidates are qualified to contest the election. All contenders must be deemed loyal to the Islamic republic and the final candidates appearing on the ballot will go a long way in showing what Khamenei’s thinking is moving forward for the regime. 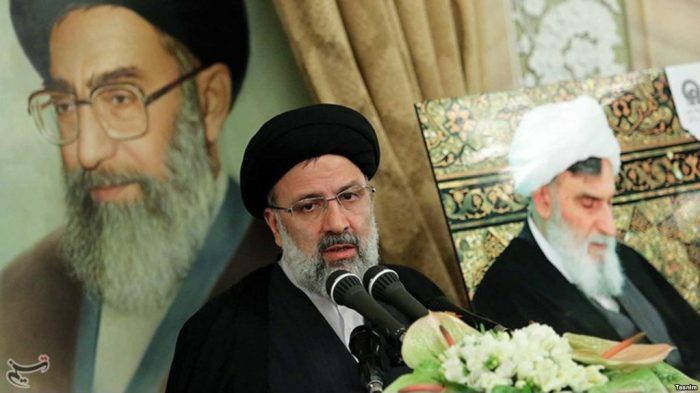 Raisi’s elevation and election to president could very well set him up as the successor to Khamenei which from the perspective of the mullahs makes sense since he is a steadfast loyalist to preserving the mullahs power and has demonstrated a willingness to massacre dissidents and rivals. All of which does not bode well for the future of the Iranian people.